In 1998, Fred Strothman (who now operates JF Strothman Distillery in Grand Junction) was building St. Kathryn Cellars Winery in Palisade, CO. There were a few issues with construction and Strothman took the unconventional step of deciding an exorcism was required. He contacted Bishop Arthur Tafoya in Pueblo, CO, who sent Fr. Paul Montez to conduct an exorcism. Strothman was pleased with the outcome and St. Kathryn Cellars opened in 1999. As a result of his visit to Colorado’s wine country, Fr. Paul was enchanted with the wine industry and decided that producing wine would be a good way for the monastery to raise funds. 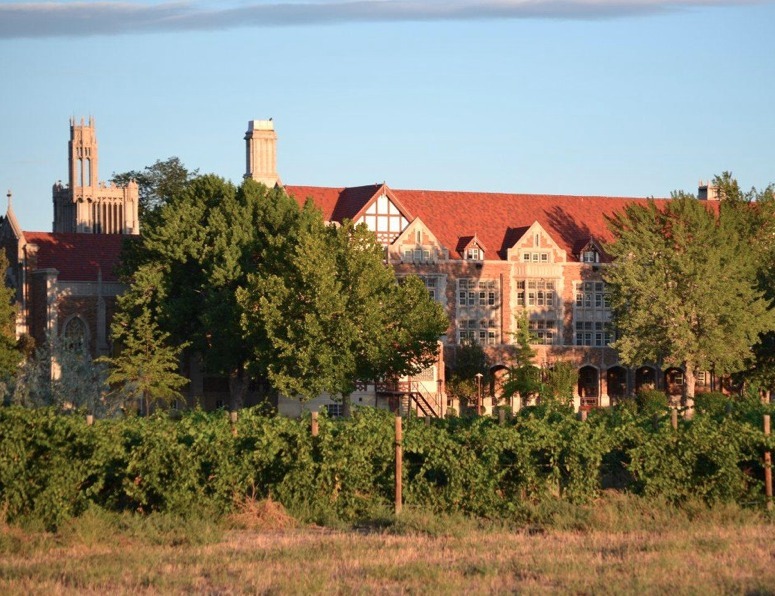 In 2002, the Benedictine Society opened the Winery at Holy Cross Abbey with winemaker Matt Cookson, on Strothman’s recommendation, at the helm. Cookson graduated from Fresno State University in 1984 with a degree in Enology. He had worked in New York state and Napa Valley before coming to Colorado. In 2006, businessman Larry Oddo moved his family from the East Coast to purchase the winery from the Benedictines and take over operations of the winery. Cookson remains as winemaker to this day while the Benedictines continue to receive financial returns on their initial vision and investment. Currently, the Winery makes approximately 12,000 cases of wine from purchased fruit largely from the western slope of Colorado and some from California and Washington. They also buy grapes and apples from local growers near the winery in the shelter valley that is home to Cañon City. Wineries buy fruit all the time. However, The Winery at Holy Cross Abbey is the only one I know of that buys grapes from a prison. The Winery at Holy Cross Abbey has developed a partnership with the Colorado Department of Corrections subsidiary Colorado Correctional Industries’ (CCi) Juniper Valley Farms. The CCi’s agricultural practices began back in 1874 as part of the Colorado Territorial Penitentiary inmate work program. Farming addressed inmate idleness, provided food products for the prison and a means of generating revenues from surplus crops. Today, more than 130 years later, CCi’s agricultural activities include dairies, farmlands, fisheries, goats, greenhouses, honey processing, recycling and of course vineyards. The Winery and the prison’s relationship began in 2002 when the prison planted merlot, riesling and chardonnay at the East Cañon City Complex. The merlot did not fare well and was replanted with concord, norton and viognier. At this time they have 22-planted acres, and the yield has been 20-44 tons. Juniper Valley Farms’ vineyard began selling their grapes to the Abbey Winery in 2005, and the Winery is their primary customer. Most of the juice from Juniper Valley Farms’ grapes makes its way into the Winery’s Wild Cañon Harvest, a sweet rosé table wine. From its inception as a monastery to its use of prison-grown grapes, the Winery at Holy Cross Abbey offers a unique story found nowhere else in Colorado, or the U.S. for that matter, to go along with its award-winning wines. In fact, Cookson’s 2010 Cabernet Franc was recently named Best in Show (Double Gold) at the 2012 Colorado Governor’s Cup winemaking competition. Any release date for the planted Norton and Viognier vines?